After Christmas, I wanted to return to my usual floral style. Thus here is a page in my style with which I had fun with. I used some gold shimmer paint and I added it to some parts of my chipboards. I also added some microbeads gold in some places over my layout. The flowers along the shapes of my chipboards accent them. A background of dark wood always gives depth in a creation. Some modeling paste and drops of ink and you have a tender background effect. next with distress ink pads in green and brown. Some distress ink in brown were added on the edge of my doily too. I put some green paint on my leafy silhouettes. I also put some distress ink on my swirl leafy shrub chipboard. So so elegant!! Adore it !! 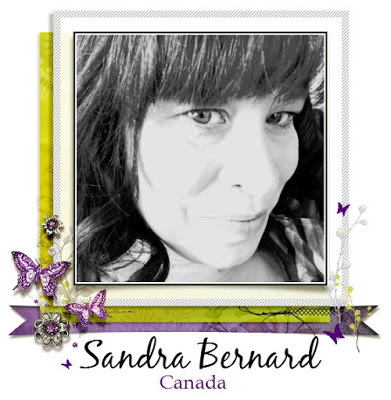 Stunning work Sandra! I love them both! Just so gorgeous. I especially love the first one. I love the gold and the peacefulness! Both of your layouts are beautiful!